Since their invention in 1817, bicycles have been used for traveling across the street, to the store, going to school, and even going to work. Today, riders for Mamma Jamma support breast cancer awareness, research, and the breast cancer survivors themselves through cycling. Shawn Michael O'Keefe utilizes his hobby of cycling as a means to support his friends and family who were impacted by breast cancer. Growing up in Dallas, Texas, I moved to Austin as soon as I could — attending the University of Texas in the early 90s. I first started racing road bikes around that time, spending a decent chunk of one semester’s student financial aid on my very first race bike, a red Specialized Allez Comp with full Ultegra components. Fortunately for my academic education, bikes were much less expensive back then. I’ve spent most of my career in emerging technologies and event production, helping to grow the SXSW Interactive Festival into what it is today. I co-founded a health technology company in 2014, and then spent three amazing years living and working (and bikepacking) overseas in Wellington, New Zealand. I now run innovation programs, such as startup accelerators, for an array of companies and government organizations. I'm currently helping the Army Futures Command with its innovation efforts as part of the Army Applications Laboratory here in Austin. I have two kiddos, an almost 10-year old son and a 7-year old daughter, and we spend a lot of time climbing at the Austin Bouldering Project, going out for sushi and/or launching model rockets. On a personal level, I ride to feel like a kid again. No other activity offers such a wide array of physical, mental and emotional benefits. And with my hectic schedule and questionable work-life balance, it’s something I can do when I have a few hours to myself — or with a group when I’m feeling social. As a “roadie,” I’ve participated in a number of charity rides throughout the years, such as the MS 150 from Houston to Austin. A number of close friends and family members have been impacted by breast cancer, so I want to do what I can to help. There’s a lot of donor fatigue with so many causes and issues to address in our world, but it’s important to let those fighting and surviving breast cancer know that they are not alone in their battle. Plus, cycling is an expensive sport — and it’s a good thing to put our fancy bikes to work for a great cause. The Martindale community is a very special one. I’m also very appreciative that the beneficiaries are such fantastic local organizations, as it’s wonderful to help create impact and change in our own communities. The beauty of the surrounding country roads ain’t bad either. With two children, it can be difficult to get a lot of quality time on the bike. I train outdoors as much as possible, which in reality averages out to about two times per week. Once a month, I try to get out of town for a proper long-distance adventure or gran fondo. I mostly focus on “gravel grinding” and endurance events these days. Before, during, and after my ride, I have good coffee. I usually end up on a bit of a coffee shop tour, actually. My favorite spots in Austin include Houndstooth, Juan Pelota at Mellow Johnny’s, and Flat Track Coffee at Cycleast. What is one thing you'd say about Mamma Jamma to convince a friend or family member to join you in the ride? Perhaps quote the character Andy Dufresne (Tim Robbins) from the film, The Shawshank Redemption: “Get busy living, or get busy dying.” A lot of my friends and family members are intimidated by riding longer distances on a bicycle, but it’s really just a mental barrier. They’d be surprised how easy and fun it is to participate in the Mamma Jamma. Not only do you get to make a direct impact in the lives of those battling and surviving cancer, you get to feel like a kid again. And that counts for a lot these days. Motivation is what drives people. For supporters of the Texas Mamma Jamma Ride, motivation comes from knowing that every second they spend coming up with donations or riding helps those who are dealing with breast cancer. For Danny Wynn, the loss of his mother to breast cancer and a small push forward by his wife motivated him to get on the journey that he is on today. Whether it be fighting fires, fighting for his own personal health, or fighting for his family, nothing changes the fact that he is always fighting to help save lives. I have been working for the Austin Fire Department for 18 years. I am currently assigned to the dispatch division. I was on operations, meaning I was on a firetruck fighting fires for 10 years and have been in dispatch for the last 8 years. My free time is spent getting in shape and spending time with my family. I have spent quite a bit of time coaching my kids in whatever sport they participate in. My daughter, Kara, is 13 years old. She plays volleyball with the Magic Volleyball club and her middle school team. My son is 8 years old and plays every sport, but right now he is focusing on flag football and basketball. Carla is my beautiful wife of 17 years. She works in Human Resources and has been working for Apple for over 3 years. I originally started riding with Texas Mamma Jamma because my mother (Rene Colvin) passed away from breast cancer on August 22, 2017. I'm not sure where my wife heard about this organization, but she suggested I ride for my mother since I had just started getting into riding a couple months before she passed. It meant a lot to me to train to ride in this event and to raise money as well. I also really enjoyed the connection I had with the organizers of this event and the people I met on ride day. I have been super impressed with the ride organization and how organized they are as well as the passion and commitment I see demonstrated when I interact with people familiar with this event. I have spoken highly of this organization and just today may have picked up two more people who will ride in the next event because of my kind words and kudos. My training routine has increased since last year. Last year, I was a beginner rider and only trained enough for the 25 mile ride. Since then, I have lost 20 pounds and now ride about 40 miles a week. I am planning on gradually increasing my miles until I can ride a 60 mile event. I also work in swimming and strength training twice a week. I have a renewed commitment to being healthy since my mom passed. She told me before she passed that it made her happy when I took time for myself whether it was working out or fishing. Since cancer runs in my family, I plan to continue riding and becoming healthier. My wife and kids come to this ride with me to support me and remember my mom. I would harp on the fact that it is a great cause that is supported by passion people. This shows by what I consider the attention to detail through the communication process way before the ride and continuing after the ride. I have participated in a few rides now and by far, Texas Mamma Jamma is my favorite. Hobbies are great ways for individuals to spend their hard-earned free time, especially if their work takes them away from home. 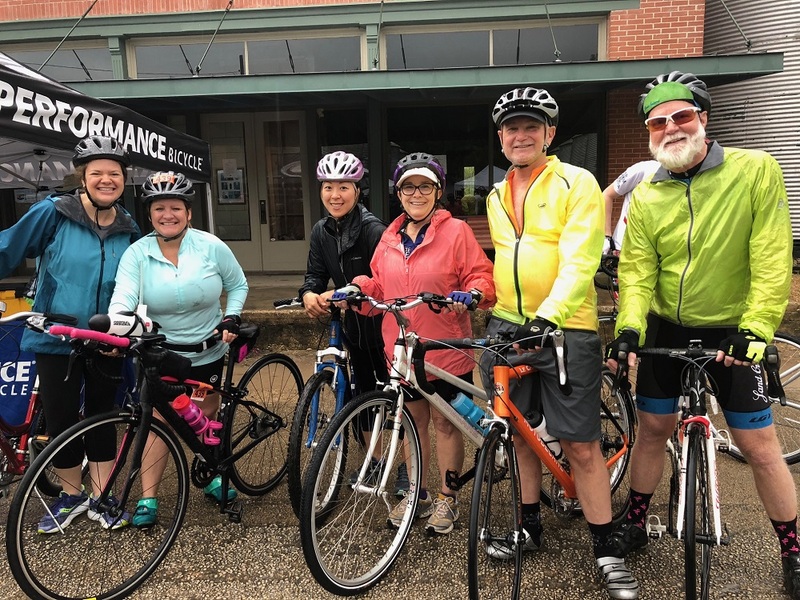 For Bridget Portier, the Texas Mamma Jamma Ride provided more than just the means for her hobby to do more than just get her to exercise and meet with friends: it gave her a way to support women and families dealing with breast cancer. I am a Houston native who has worked in Hospitality/Tourism for over 20 years. I started my hospitality career in Houston, Texas in 1996, then a promotion required a relocation to Dallas in 2005. Ten years later, I moved to Newport Beach, California for another exciting career opportunity. After a year in California, I was ready to head back to Texas. In 2016, I joined the amazing team at Visit Austin, the destination marketing organization for this terrific city. I am single. No kids, but I have two beautiful nieces and two awesome nephews who I adore. My brother and his family live in Spring, Texas, just north of Houston. I am a food and beverage enthusiast, so in my free time I love to try new restaurants, breweries or wineries. I also enjoy hiking, biking and sailing. In 2017, I took a few classes at SoulCycle and I loved it. So, it occurred to me that if I enjoyed riding a stationary bike, I’d really enjoy riding outdoors. I decided I wanted to invest in a good street bike and start exploring Austin. I saw it as a great opportunity to meet people and build a community of friends, especially since I’m still relatively new to the city. I started training with a novice group organized by Performance Bike Shop on South Lamar. One Saturday following a training ride, one of the guys from Performance Bike Shop told me about Texas Mamma Jamma Ride. I have two cousins who have been diagnosed with breast cancer, so I knew immediately that I wanted to join the cause and give my new hobby a higher purpose. I like training in the morning. I start with a hot breakfast and plenty of water. When I train alone, I usually head over to the Veloway and get in 10–15 miles. I also enjoy riding Southern Walnut Creek trail. I usually take a 1-hour nap after I’ve enjoyed a nice long ride. What stands out to you personally about Texas Mamma Jamma Ride? Before completing my first Texas Mamma Jamma Ride, what really stood out to me was how organized the training rides were and how welcomed I felt right from the start. It felt like a community. There is a synergy and camaraderie among the riders that is just so authentic. I looked forward to the training rides week after week because even if I didn’t meet someone new or strike up a great conversation with another rider (which happen during most training rides), I always enjoyed the energy of this group. That energy is passion, perseverance, and persistence all rolled together. It’s simply amazing. What is one thing you'd say to convince a friend or family member to join you in the ride? 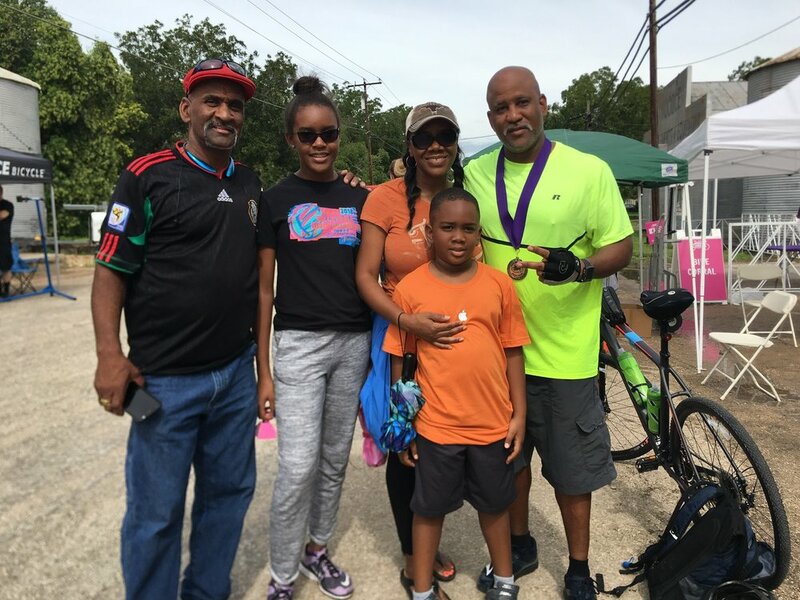 The Texas Mamma Jamma Ride is raising money for breast cancer, which of course is a worthy cause, but riding along survivors was the most inspiring experience because it is proof that early detection is so important. Riding with these men and women inspire hope not just for a cure, but for a better tomorrow when women can get the care they need and the cure they deserve. Individuals who have or have had breast cancer rely on support from family, friends, and the community to keep pushing forward towards recovery. Texas Mamma Jamma Ride is proud to have individuals who dedicate not only their time, but their entire line of work towards helping those affected by this disease. Hilda Eisele, rider and captain of Team Titti Babies, supplies our community with medical equipment and shared her reason for riding with Mamma Jamma. My name is Hilda Gracie Eisele. I work for P&H Services, which is a medical equipment supplier in the Greater Austin Area. I have 3 grown children, Missy, Abe and Andrew. I started this business in 1994 as a medical billing service and in 2003, it became a medical equipment supplier servicing the breast cancer community. My passion is cycling. In my free time, I love to work out by cycling both indoors and outside. I ride in Mamma Jamma every year because I enjoy the energy of cycling and I like to channel that energy to celebrate all the successes of the breast cancer survivors in Central Texas. My personal connection to the community is all the beautiful and heroic customers who come to our business to get Products to Heal and People to Help, hence the name of my business, P&H Services. For the ride training, most of my riding is done indoors in cycling classes or at home in my studio. I have my own personal goals of 3 rides per week and always try to use my goals as a minimum. I also participate in the training rides held by Mamma Jamma volunteers when I am in town. Getting enough rest and fluids 2 days before the ride is important. Other preparations for the ride include recruiting new team members and growing the team, Titti Babies. Last year we fielded 9 riders, and this year we are looking to increase to 12. Each team member is expected to do fundraising as part of their participation on the team. All the riders and volunteers come together to raise funds for a great common cause. Also, rain or shine, the teams bring their best to the event which is held in the Fall in Martindale. Last year, we traversed a few flooded roads due to the heavy rains the night before the ride. Why not help? Life's greatest rewards come from giving your time and energy. Mamma Jamma is a great organization where you can make a difference for all those affected by breast cancer. It is not a race, but a ride that does not require you to ride any more than your body can do. Plus, you can join my team, Titti Babies! You get a free cool jersey if you join my team! Texas Mamma Jamma Ride takes pride in having a wonderfully diverse community of riders. Whether it’s a new rider or someone who rides a lot, all strive for the same goal: to support women and families living with breast cancer in our community. Kim Flores, team captain of Team vcfo was kind enough to allow us to ask her about her reason for riding. I’m the Vice President of Human Resources at vcfo. I am married with two boys – ages 8 and 12. In my free time I like to read, cook and bake. I’m a huge fan of the Great British Baking Show. I learned about the Texas Mamma Jamma Ride through our involvement with the Entrepreneurs Foundation. Our employees liked the idea of being able to ride Mamma Jamma as a team to support this great organization. We had a “first time to ride” team with four of our Austin employees, one spouse and one of our clients. I personally have a long-time family friend who battled breast cancer and I rode in honor of her journey. I have to confess that I didn’t train heavily for this ride but it was perfect for a first-timer. I ride my bike occasionally with my 12-year-old on the trails near our house but hadn’t gone for a 15-mile ride in years. I definitely will train for 2019 but I was able to complete the ride on my pseudo-cruiser bike with no issues. What stands out to you about Texas Mamma Jamma Ride? One of the things that I really loved about Mamma Jamma is that it benefits many different aspects of breast cancer support such as providing medical equipment, support groups, post-cancer support and treatments, etc. Any rituals before or after the ride? We didn’t have rituals in 2018 other than a lot of praying that the rain and thunderstorms would subside – which they did! Our team enjoyed spending some time in Martindale post-ride relaxing, enjoying the lovely lunch and live music and watching other riders arrive. This is a fantastic ride for a new rider. Half of our team had never ridden in a ride like this and we all made it to the end with smiles on our faces.